The structural, geometric, spectroscopic, and electronic properties of the 1-(benzyloxy)urea (C8H10N2O2) molecule were investigated using experimental and computational methods. 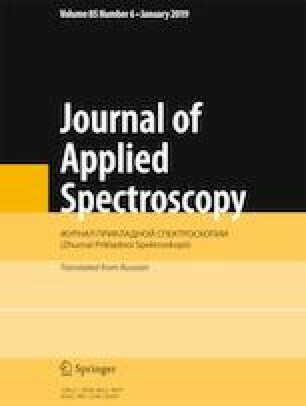 The experimental studies were performed via FT-IR, Raman, and NMR spectroscopies for the determination of vibrational and magnetic properties of the title compound. The molecular geometry optimization, vibrational wavenumbers, proton and 13C NMR chemical shifts (in DMSO), HOMO–LUMO analyses, and UV-Vis spectral parameters (in DMSO) for the title molecule were computed with the DFT/B3LYP method at the 6-311++G(2d,2p) basis set. The assignments of harmonic vibrational wavenumbers were computed using the VEDA 4 software program in terms of potential energy distribution (PED). The HOMO–LUMO and UV-Vis analyses were used to determine intramolecular charge transfer and electronic transitions in the title molecule. The experimental values of vibrational frequencies and NMR chemical shifts are in a good harmony with the computed values. Abstract of article is published in Zhurnal Prikladnoi Spektroskopii, Vol. 86, No. 1, p. 155, January–February, 2019. National Institute of Advanced Industrial Science and Technology (AIST), Spectral Database for Organic Compounds, SDBS; http://sdbs.db.aist.go.jp Cited September 30, 2017.